Add Comfort to your MattressThis 2″ thick gel-infused memory foam mattress topper will bring new life to any mattress. 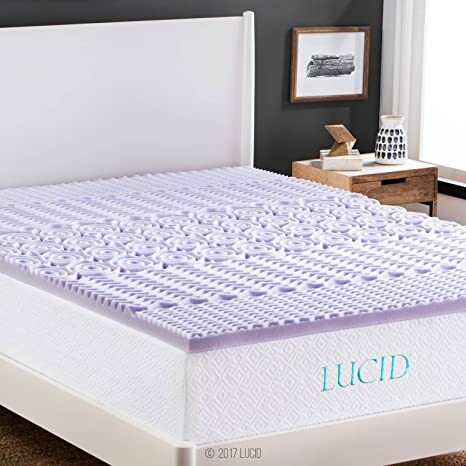 The ventilated gel-infused memory foam captures and distributes heat, allows air flow, and helps regulate sleeping temperature – keeping you comfortable while you sleep. The 3-year warranty provides increased peace of mind for your purchase.Soft, Supportive ConsistencyOpen cell construction yields a longer lasting, more resilient foam that allows you to move freely without sinking into long-lasting body impressions. The soft consistency quickly conforms to weight and pressure. This mattress topper will help relieve neck, back and shoulder pain by reducing pressure points. This in turn helps to correctly align your spine by supporting the natural curves of your head, neck and shoulders.Certified SafeThe foam is CertiPUR-US certified. That means the foam used in this product has been tested and certified by an independent laboratory saying it meets special criteria for physical performance, indoor emissions and environmental stewardship. It contains no formaldehyde, harmful phthalates, or PBDE flame retardants and is low VOC. 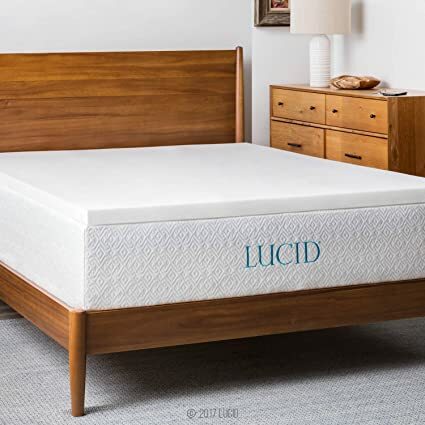 This mattress does not contain synthetic or natural latex of any kind.Compressed for Easy SetupThis memory foam mattress topper comes compress and boxed for easy transportation and setup. To set up your topper, move the near your bed and carefully remove packaging. As it decompresses, the memory foam may have a faint odor. This foam smell is completely safe and should dissipate in a few days. The odor may be reduced by leaving the mattress topper in an open, ventilated space or even near a window during its expansion period. 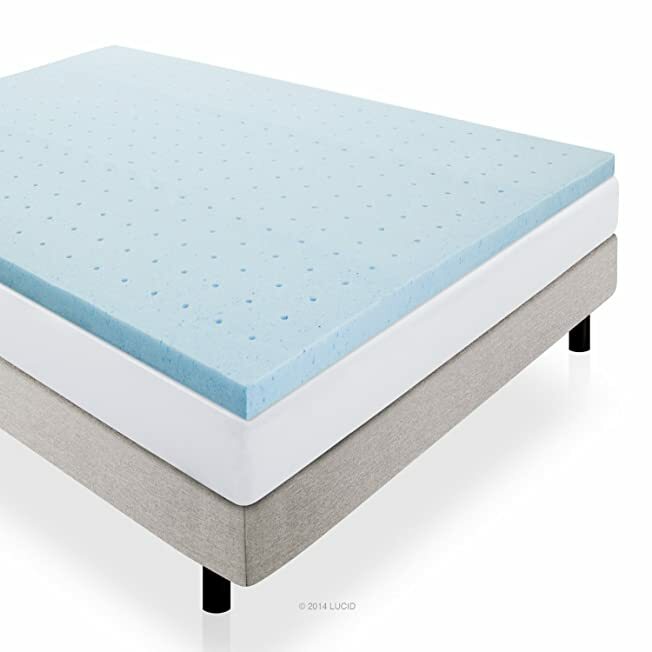 Bring new life to your mattress want a way to bring new life to your mattress without killing your wallet this 2-inch memory foam mattress topper is the perfect solution because it will give you most of the benefits of having a new mattress at only a fraction of the cost. These toppers are designed so your fitted sheet will still be tight over both the mattress and the topper. This is done by making the topper 1 inch shorter on all four sides than an industry standard-sized mattress. The benefits of memory foam LUCID memory foam creates a comfort layer that helps relieve neck, back and shoulder pain as it cradles and supports your body’s natural pressure points. The memory foam works through the night to correctly align your spine, improving your posture and preventing lower back pain. The ventilated memory foam optimizes air flow to keep you cool for a comfortable sleep. Open cell technology makes for a durable, more resilient foam that will not leave long-lasting body impressions. Certified safe this mattress is made of CertiPUR-US certified foam. That means the foam in the mattress has been tested and certified by an independent laboratory saying it meets special criteria for content, physical performance, indoor emissions and environmental Stewardship. Careful construction guarantees no Prohibited phthalates, no ozone depletes, no CFCs, no mercury, no lead or heavy metals, no formaldehyde, no PBDEs, and low emission (VOCs) for indoor air quality. Setup suggestions memory foam may give off a harmless odor as it off-gasses during initial expansion. We recommend you open the mattress in well-ventilated room and wait 24 hours before sleeping on your new mattress. Some people are more sensitive to odors and may want to wait longer before using the mattress. The smell should dissipate within 48 hours. LUCID is proud to offer the worlds’ first variable magnifier for red dot sights. Now the operator is able to transition quickly between a CQB operation to a designated marksman capability in an instant with the same weapons platform, all the while maintaining quality target identification and precision shot placement. LUCID’s 2x-5x Variable Magnifier mounts behind any red dot sight (with the right mount). 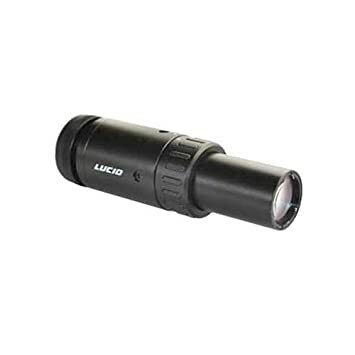 This high quality optic offers crystal clear optical performance and maintains an expansive field of view with a comfortable eye relief through the entire magnification range. NOTE: The 2x-5x Variable Magnifier from LUCID has been updated to offer an ocular focus ability. 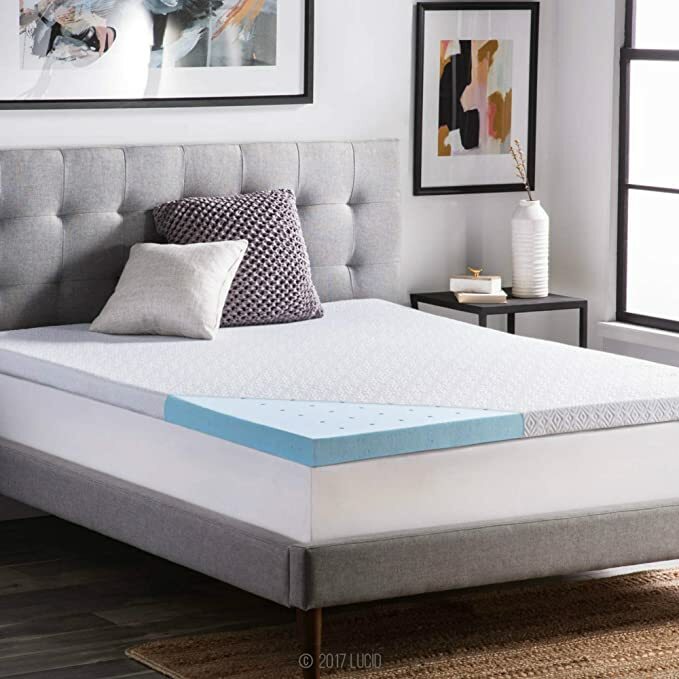 Benefits of a Foam TopperThis 2-inch thick solid foam mattress topper made of traditional foam offers a responsive comfort layer at a smaller price. With naturally hypoallergenic foam, this topper will conform to your body weight and position to offer comfort and pressure relief. This foam helps to improve comfort by properly supporting your head, neck, and shoulders. The mattress toppers are cut one inch shorter on all sides to ensure your sheets fit over the topper. Improve Your Current MattressEnhance your mattress with this solid foam mattress topper by LUCID. This 2-inch thick topper is designed to be placed right on top of your current mattress for an added comfort layer. This topper will improve the current feel of your mattress and extend its life.Great for CampingAdd a layer of comfort to your RV or camper mattress, or put a comfort layer between your sleeping bag and the ground. This affordable mattress topper brings comfort to the great outdoors.3-Year WarrantyRest easy with a 3-year warranty. This warranty protects the mattress topper against manufacturer’s defects. Want a way to bring new life to your mattress without killing your wallet? This 2-inch memory foam mattress topper is the perfect solution because it will give you most of the benefits of having a new mattress at only a fraction of the cost. These toppers are designed so your fitted sheet will still be tight over both the mattress and the topper. This is done by making the topper 1 inch shorter on all four sides than an industry standard-sized mattress. 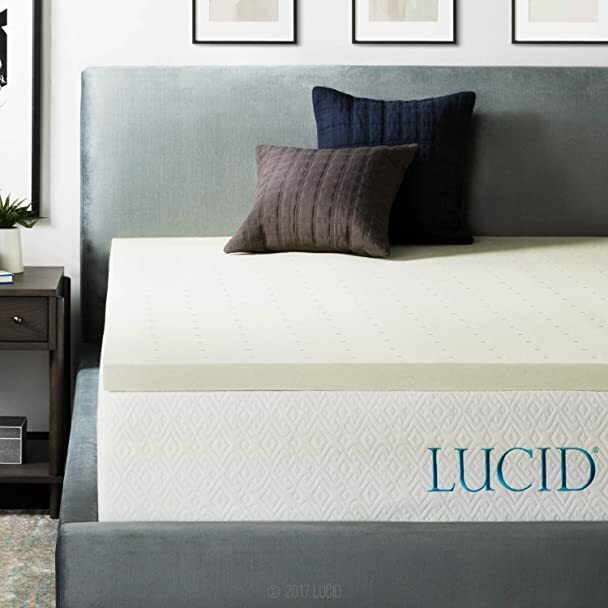 LUCID memory foam creates a comfort layer that helps relieve neck, back and shoulder pain as it cradles and supports your natural pressure points. The memory foam works through the night to correctly align your spine, improving your posture and preventing lower back pain. The ventilated memory foam optimizes air flow to keep you cool for a comfortable sleep. Open cell technology makes for a durable, more resilient foam that will not leave long-lasting body impressions. This mattress is made of CertiPUR-US certified foam. That means the foam in the mattress has been tested and certified by an independent laboratory saying it meets special criteria for content, physical performance, indoor emissions and environmental stewardship. Careful construction guarantees no prohibited phthalates, no ozone depleters, no CFCs, no mercury, no lead or heavy metals, no formaldehyde, no PBDEs, and low emission (VOCs) for indoor air quality. Memory foam may give off a harmless odor as it off-gasses during initial expansion. We recommend you open the mattress in well-ventilated room and wait 24 hours before sleeping on your new mattress. Some people are more sensitive to odors and may want to wait longer before using the mattress. The smell should dissipate within 48 hours.